Jeff will keep 75 percent of their Amazon stocks, leaving MacKenzie with just a quarter which represents a four percent stake in the company worth around $36billion at current value. 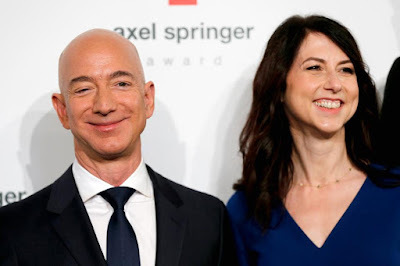 Jeff's 12 percent stake is now worth around $100billion which allows him to retain his title as the richest man in the world, with $4billion more than Bill Gates. He will also take voting control of his ex-wife's remaining quarter and has been given her stock in The Washington Post and Blue Origin, his space exploration company. The pair announced the details in tweets on Thursday afternoon but offered no explanation as to why MacKenzie, who helped build the company, will walk away with just half of what she is entitled to after 26 years of marriage. 'It means more than you know. MacKenzie most of all. I'm grateful for her support and for her kindess int hsi process and am very much looking forward to our new relationship as friends and co-parents.